This volume presents an international group of researchers who model animal and human behavior--both simple and complex. 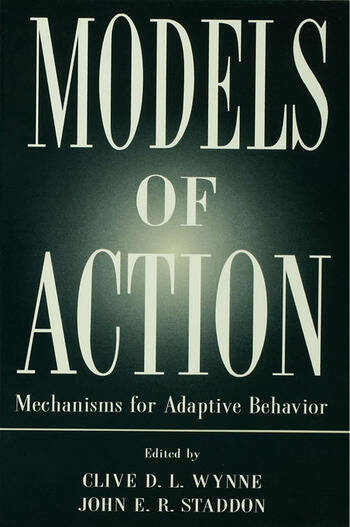 The models presented focus on such subjects as the pattern of eating in meals and bouts, the energizing and shaping impact of reinforcers on behavior, transitive inferential reasoning, responding to a compound stimulus, avoidance and escape learning, recognition memory, category formation, generalization, the timing of adaptive responses, and chromosomes exchanging information. The chapters are united by a common interest in adaptive behavior--whether of human, animal, or artificial system--and clearly demonstrate the rich variety of ways in which this fascinating area of research can be approached. In so doing, the book demonstrates the range of thought that qualifies as theorizing in the contemporary study of the mechanisms of adaptive behavior. It has two purposes: to bring together a very wide range of approaches in one place and to give authors space to explain how their ideas developed. Journal literature often presents fully-formed theories with no explanation of how an idea came to have the shape in which it is presented. In this volume, however, leaders in different fields provide background on the development of their ideas. Where once psychologists and a few zoologists had this field to themselves, now various types of computer scientists have added great energy to the mix. Contents: B. Goertzel, Learning the Language of Mind: Symbolic Dynamics for Modeling Adaptive Behavior. S. Grossberg, Neural Substrates of Adaptively Timed Reinforcement, Recognition, and Motor Learning. E.J. Kehoe, Can the Whole Be Something Other Than the Sum of Its Parts? P.R. Killeen, The First Principle of Reinforcement. J.R. Koza, Using Biology to Solve a Problem in Automated Machine Learning. N.A. Schmajuk, D.W. Urry, B.S. Zanutto, The Frightening Complexity of Avoidance: A Neural Network Approach. J.E.R. Staddon, B.S. Zanutto, In Praise of Parsimony. C.D.L. Wynne, A Minimal Model of Transitive Inference.